For the first time since the 2010 presidential election Belarusian independent journalists can catch their breath. In March the criminal case against Andrzej Poczobut, a journalist accused of libel against the president, was dropped. ARCHE magazine, which was close to being shut down was finally re-registered by the Ministry of Information in May. OSCE Representative for Freedom of the Media Dunja Mijatovic was allowed to enter the country in June, and authorities even met with her. Following her visit charges against Anton Suriapin for posting pictures of the famous Teddy Bear pictures, were dropped. Award-winning journalist Iryna Khalip has reached the end of her two-year sentence. On the other hand, we should not be deceived by these positive developments. Negotiations with Mijatović did not prevent Belarusian authorities from seizing a whole print run of Nash Dom newspaper, accusing journalist Alena Sciapanava of cooperation with foreign media without a relevant accreditation, or detaining a number of reporters covering a street action by opposition activist in July. 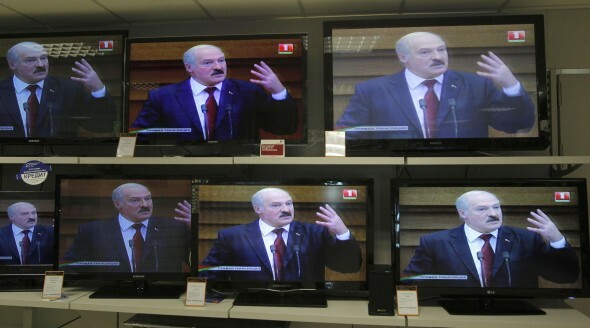 So, is there a thaw for Belarusian media? Can further changes be expected? Belarus is ranked 157th in Reporters Without Borders’ 2013 World Press Freedom Index, rising 11 places compared with their 2011/2012 rating. But this only means the country has restored the situation to where it had been before the severe clampdown on free media and civil society in December 2010. Independent journalists and online activists still run risks. “The authorities have made a small step forward after they made two huge leaps back. The situation improved a little if we compare it with the one we had after the 2010 presidential election. But on a systemic level neither media-related legislation, nor its implementation have changed,” says Andrei Bastunets, a media lawyer and a vice chairman of the Belarusian Association of Journalists (BAJ). The positive developments are welcome – but history suggests they are not irreversible. In 2008-2009 similar period of “liberalisation” was marked with two big conferences in Minsk co-organised by the Belarusian authorities with the office of OSCE Representative for Freedom of the Media. There, the decision was made to return two national independent newspapers, Narodnaya Volia and Nasha Niva, to the wide reaching state run systems of press distribution. But the ‘good times’ turned into a renewed period of repression after 2010. Sviatlana Kalinkina, chief editor of Narodnaya Volia, says life is easier for the publication now than it was five years ago when it had to be printed in Russia and was not allowed to be sold at newsstands or via subscription catalogues in Belarus. “The approach of the authorities is to make the situation worse, then to return it to where it was and thus claim there have been improvements and ‘democratisation’. But in fact even after we were allowed to be printed and distributed in Belarus we were not able to come back to where we used to be. Narodnaya Volia used to be a daily, now we publish our newspaper twice a week and cannot get a permission to be printed even three times a week. Printing houses and distribution networks keep telling us it is impossible, although it is obvious these are just lame excuses. These problems are clearly orchestrated by the authorities,” says Sviatlana Kalinkina. It is difficult for a journalist of an independent newspaper to receive a comment from state officials; they are afraid to talk to non-state press. According to Yanina Melnikava, the editor of the online publication Mediakritika.by, the situation inevitably affects the quality of work of Belarusian journalists. “One the one hand it makes a journalist’s work really hard. But working in the conditions of an ‘information war’ leads to a ‘barricade mind-set’ that can be used to justify mistakes and lack of professionalism,” says the editor. Sviatlana Kalinkina of Narodnaya Volia does not think conditions for her newspaper will significantly improve in the nearest future, because the next presidential election is scheduled for 2015. “Political campaigns are not the best time for journalists in Belarus. People are getting more interested in independent news which makes authorities start to panic, resulting in more oppression,” Sviatlana Kalinkina says. So why would the government allow some minor improvements of the situation? The answer is simple – just to have some “room for manoeuvre” when the screws are to be tightened again. “The closer elections are, the more we are likely to feel freedom and democratic change is possible. But this is just an illusion. The reality is different. The authorities see election campaigns as a threat to their power and they are ready to protect their power whatever it takes,” says Yanina Melnikava. “But the real change requires a totally different relationship between the authorities and the media. Such change of an attitude should take place on an ideological level, as well as on economic and legal levels”, Yanina Melnikava admits, adding that she sees no signs of such changes at the moment. Andre Bastunets suggests there should be a road map the authorities can keep to in order to liberalise the media field. The first step would be ceasing of economic discrimination of independent media: all non-state newspapers should be allowed back on to state-run distribution systems, restrictions of circulations and advertising in them should be lifted. “About half of independent newspapers face problems like these now. And there is no need to change the law to solve the problem – on the contrary, we just need to implement the law,” says BAJ vice chairman. The second step would be to ensure access to information for all journalists. The restriction to work without a special accreditation for reporters of foreign media should be lifted. The third one is to stop differentiating between state and non-state media at all. “I am sure there should be no state-owned media in a democratic country except for bulletins with legal acts adopted by state bodies. All media should be private or public,” says Andrei Bastunets. However, the authorities of the country show no signs they are ready event to make that first step, which means the current not-so-bad situation is always under threat of a set-back. Liudmila Yanenka is a freelance journalist from Belarus.